Animals Predicting Earthquakes | Indigenize! 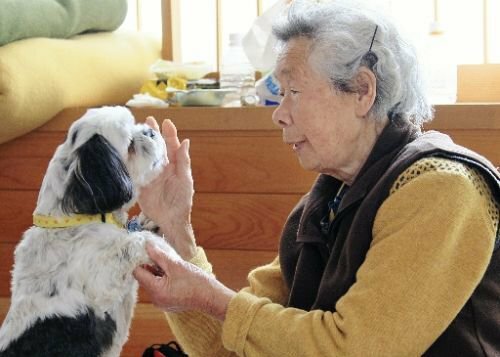 Yomiuri Shimbun reported that after the recent earthquake in Japan, this 12-year-old Shih Tzu, “Babu,” saved the life of her beloved 83-year-old Tami Akanuma by forcefully and steadily leading her to the higher ground – before the first wave of tsunami came and swallowed their house completely. It’s always a good idea to heed other animals on matters like this. Similar examples abound: pet dogs and cats acting nervous like they do before big storms, bees leaving their hives, catfish violently flailing around, chickens ceasing to lay. Days before an earthquake devastated the Greek city of Helice in 373 B.C., animals including rats, snakes and weasels all were seen deserting the place. I wonder what sort of senses they’re using that alert them to seismic activity. Could they be feeling changes in the earth’s electromagnetic field, electrical changes in the air? Maybe that has a scent! Or can they feel (or even hear) the change in vibratory frequency caused by minute early shifts deep in the soil itself? Such evidence can easily be dismissed as anecdotal, but it seems to me that heeding what we observe in the more-than-human world is the basis of not only good science, but often of survival. Such a practice is how we’ve learned about a great number of the plants that formed the basis of some of our strongest modern pharmaceutical medicine, for example. I take comfort in the fact that we can still rely on these elder species for excellent advice. All we have to do is pay a lot more ongoing, respectful attention. What was the animal connection in Haicheng? Life Rule 162: If the animals are running uphill – follow them.